Hey beauties! Earth Day is April 22nd! What are you doing to help? Soap and Glory sells a ton of shower gel! The average shower uses 2.51 gallons of water per minute! 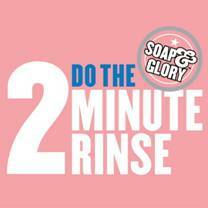 So this Earth Day you can help out by doing the Soap and Glory 2 minute rinse. What is that you ask? -Step 3: Massage on your hair conditioner and scrub your feet with a brush, rinse for 40 seconds, turn the tap off and your done!